Our flight took off from San Francisco around 10:45pm PT (1:45am ET) and we landed at DTW at 5:30am ET. Our lay-over was just over three hours. That's not enough time to really nap for me and I'd barely slept on the plane. The in-flight monitors spammed Meet the Fockers, Glee, and some other random shows all night. Unlike the previous flight, this flight did not have monitors on the back of each seat, so there was not turning off the monitor if you didn't want to watch airline commercials and crappy TV. Luckily there's hardly and sound so you need headphones to hear anything. 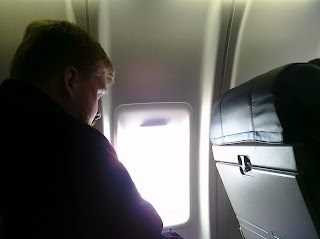 We flew back to Grand Rapids on a relatively small plane, at least from what I've been on before. But it's a short flight. We were in Grand Rapids by 9:30am and greeting the pets by 10am. It was a looong trip back. You don't realize how much an overnight flight messes with your schedule until it's the middle of the next day and you realize you still haven't changed or taken a shower since your flight left the day before. I'd honestly have taken more photos (especially of a hyper Peppy and a needy Leki) if I hadn't spent most of the day in a sleep-filled haze (that is - when I wasn't actually sleeping).